Though we have many breeds here which we love and care for equally, Irish Setters remain our passion. Our goal is to provide beautiful, quality companions to good show and pet homes. 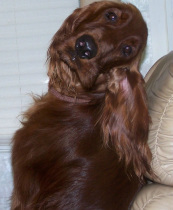 We strive to maintain the standards of the Irish Setter breed and all of our dogs are OFA and PRA certified. We are members of the Irish Setter Club of America and the Irish Setter Club of Greater New Orleans. We are committed to the ISCA Breeder's Code of Ethics. Feel free to take a look around and enjoy what we have to offer!